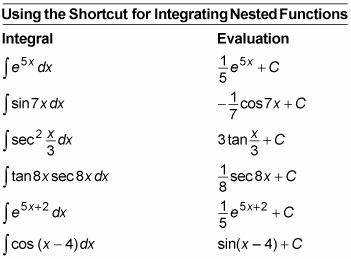 You can use a shortcut to integrate compositions of functions — that is, nested functions of the form f(g(x)). Technically, you’re using the variable substitution u = g(x), but you can bypass this step and still get the right answer. You know how to integrate the outer function f.
The inner function g(x) is of the form ax or ax + b — that is, it differentiates to a constant. Write down the reciprocal of the coefficient of x. Multiply by the integral of the outer function, copying the inner function as you would when using the Chain Rule in differentiation. The outer function f is the cosine function. The inner function is g(x) = 4x, which is of the form ax. The table gives you a variety of integrals of the form f(g(x)). As you look over this chart, get a sense of the pattern so that you can spot it when you have an opportunity to integrate quickly.